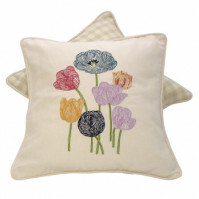 Flora Garden Cushion 55/45 Linen/Cotton Honey/Green on Cream Plain Back .. Pretty hand-embroidered wash-bag. 55/45 Linen/Cotton. 27 cm x 18 cm ..
55/45 Linen/Cottonon Colour: Pink/Green 35cm x 25cm Backing Colour: ..